According to Coldplay’s Chris Martin, “You gotta wear the right trousers if you’re gonna be a rock star”. 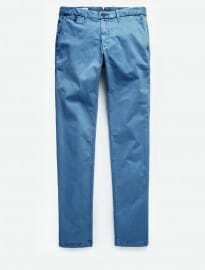 Here at FashionBeans, we believe you’ve got to wear the right trousers even if you’re going grocery shopping around the corner. It’s a known fact men often prioritise blazers, shirts and shoes over legwear, meaning the world is filled with saggy-looking behinds, accordion legs and peeking bum-cracks. Due to limited cash flow or a simple delay in growing up, many of us take too long to evolve from our teenage wardrobes. We tend to go too skinny or too baggy, depending on our cultural references, musical idols and peer pressure. Of course, at this stage in life it doesn’t really matter, because anything goes until we hit thirty. We feel a desperate need to dress to impress, as career pressures increase. We splurge a little bit more, buying quality, and, for a moment, we manage to get the look right. Unfortunately, many of us are not as lean as when we were in our twenties and fit becomes all the more important. Working harder and exercising less, coupled with a slower metabolism and increased family commitments, there’s a staggeringly high number of thirty-somethings completely ‘sausaged’ or ‘muffin-topped’ due to ill-fitting slacks. It’s the age of giving up. Sadly, by the time many of us hit forty, a sense of defeat takes over our fashion mojo. In-shape, average and out-of-shape guys tend to prioritise comfort and often buy shapeless pieces from uninspiring retailers – slipping on baggy chinos as if there was nothing left to dress up for in life. We realise how we should have been more attentive to how we looked in decades past. 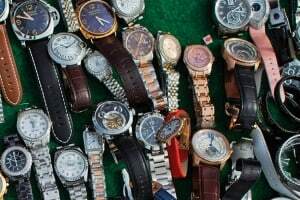 Now with conscience of such fact, we feel overly careful to adopt fashion, resorting to older men’s styles and turning our backs on style once and for all. 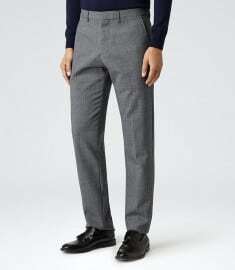 Trousers cover approximately 63 per cent of our body length (including parts that are overlapped by jackets). This should give you an idea of how visible they are and how trousers influence your overall silhouette. The majority of men want to look trimmer/fitter, taller and smarter. All without sacrificing comfort, of course. 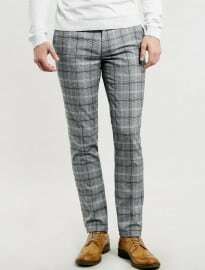 There will be some sacrifice in comfort if we’re going to get you to adopt leaner cuts, but under no circumstance should a gent’s tailored trousers or chinos be clingy, tight or restrict movement. This would only generate insecurity and there’s rarely anything less attractive that a man without confidence. Volume Around The Waist: No matter what size your waist is, it shouldn’t have a single centimetre added to it. Make sure your trousers are the right size, fit comfortably around the waist and skim your abs/tum/belly as gracefully as possible. Keep in mind your belt should not be entirely responsible for holding your waistband in place. Legs: There are various leg widths/openings/cuts on the market these days, and they should be used to either accommodate thicker thighs (no matter if they’re squat rack or pizza built, they shouldn’t challenge the seams of the garment) or create the illusion of width for chicken-legged fellows (in this case bulkier fabrics or a slightly straighter leg might help). Length: From the top of your ankles to right before touching the floor, the length of your trousers can be adjusted in order to balance your proportions or create a style statement (see: the current trend for cropped trousers). Just keep in mind that it’s mandatory they fall down straight – no pooling around the ankles or excessive breaks please. 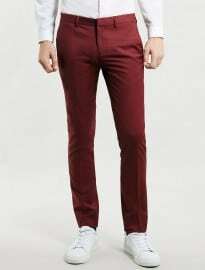 Your tailored trousers and chinos have to be more flexible this season. They’ll be combined with trainers, sweatshirts, and even t-shirts if you’re following key trends. This means you’ll need to play it cool – stay away from skinny fits and go for a tapered leg that allows for movement. Having them hemmed (or giving them a couple of turn ups) just at the end of your ankles will help produce the dressed-down feel we are looking for. Enhance the aesthetic with contrasting socks, or go sockless (at least until the weather worsens). For you early adopters with no lack of confidence when it comes to your height, an emerging trend is the wider-leg trouser. Often coming in wool, cotton or technical fabrics, sometimes with elastic or ruched waists, they’re in sync with AW14’s focus on longer and more relaxed outerwear silhouettes. Like advised above, they must still fall straight with no bulking of fabric whatsoever. Think you can handle it? As it gets nippier outside, you’ll naturally detract from colour and go back to darker shades of charcoal, navy and black. But what if you insisted on wearing that red pair of chinos that looked great on you all summer, matching them with your tweed jacket or overcoat? Let colour be the unexpected addition to your attire this winter. Don’t forget classic cold-weather patterns, either. There’s plenty to be said about Prince of Wales check trousers combined with trainers or rugged boots. If you are a classicist, these small twists can make a huge difference to your look. Grey and navy wool/flannel trousers, which you’d normally pair with black, look even richer with a chocolate brown belt and shoes. Speaking of belts, make sure you lose it if your shoes match too well or not at all. A belt should never be completely detached from your overall aesthetic, but just as uncool is a matchy-matchy ensemble. 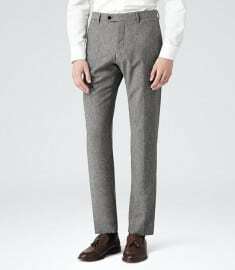 Creased trousers are slimming and elongating. You’ve probably done this to your tailoring, but have you ever tried creasing your chinos? It’s slightly pretentious, but, skilfully done, this little trick might be the change of styling you’ve needed for a long time. We hear many people advising men to stay clear of pleats: it’s a known fact they add a few inches to our waist. But for taller gents, especially those who are seeking to add some bulk to their skinny frames, this might be just what the doctor ordered. Keep the shirt slim to make the best of this contrast. So, what is your take on your current trousers collection – up for a change? Any personal quirks you’d like to share? Any new ideas for this season?